Take on the adventure of exploring the dramatic mountains of the Spiti Valley on an 8-day motorbiking itinerary. You'll visit the famed crescent-shaped lake of Chandratal, travel to distant villages of Chitkul and Komik, ride through the high-altitude pass of Kumzum-La, visit the historic monasteries of Dhankar and Tabo, apart from a range of other destinations. With powerful Royal Enfield motorbikes on hand, you'll roar through the barren mountains of Spiti, with an entourage of like-minded motorbikers and an experienced support team. Spiti, a cold desert mountain valley, sits at the intersection of India and Tibet. The valley offers a unique blend of Indo-Tibetan and Buddhist cultures, emphasized by ancient monasteries, some of which date back a thousand years. The valley is also home to an off-beat motorbiking route that has started gaining popularity only in the recent few years. The reason for this emerging popularity is quite apparent with the incredible beauty of the valley's snow-capped summits and imposing mountains, rising far beyond the clouds. Your Spiti motorbiking adventure begins in Delhi. As you head north towards the Spiti Valley, you'll halt at small, hillside villages and visit cultural landmarks and monastery. You'll explore Kaza, the largest city in the valley, and camp in Swiss tents near the Chandratal Lake. You'll circle back to the lush, green valleys of Manali, ending the tour with unforgettable experiences. • Explore Spiti Valley on an 8-day motorbiking adventure. • Visit distant villages like Chitkul and Hikkim. • Spend a night in Swiss tents near the Chandratal Lake. 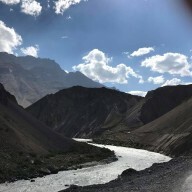 • Get absolutely stunning views of mountains and hills in the Spiti Valley. Travellers are required to follow all instructions of the road captain during the Spiti motorbiking trip. The tour operator reserves the right to alter or cancel the itinerary of this Spiti motorbiking trip due to any unforeseen circumstances to ensure maximum safety of travellers and staff. Costs arising due to such a change in itinerary will be borne by the traveller. There is no pick-up for this Spiti motorbiking trip. There is no drop-off for this Spiti motorbiking trip. Arrive in Delhi and meet your fellow motorbikers. Your Spiti motorbiking adventure begins with a morning ride from Delhi to Theog. You'll ride through the cities of Panipat, Kurukshetra, Chandigarh and Shimla as you leave the plains behind and enter the mountains of Himachal Pradesh. Overnight in a hotel at Theog. As you continue riding from Nako to Kaza, the terrain begins clearing away as the greenery disappears and the imposing barren mountains of Spiti dominate the horizon. En route, you'll visit a string of ancient monasteries at hillside villages of Dhankar and Tabo. Today's destination is the city of Kaza, the largest city in Spiti Valley. Overnight in a hotel at Kaza. The most scenic of all routes, today's journey from Kaza to Chandratal Lake takes you along rough mountainous roads via the Kunzum Pass. On the way, you'll ride through multiple waterfalls that spill from the top of mountain cliffs and cross the roads on their way down. You'll camp at a short distance away from the Chandratal Lake and visit the calm and cool waters of the lake with a 30-min trek. Overnight in Swiss tents at Chandratal Lake. On the last day of your motorbiking adventure, you'll ride from the Chandratal Lake to Manali. There are numerous water crossings on the way to Manali before you join the smooth and wide national highways. You'll cross the famous Rohtang Pass and reach the hill station by late afternoon. Overnight in a hotel at Manali. Ride from Chandratal Lake to Manali. You'll be accommodated in a hotel at Manali. Today's meal package includes breakfast and dinner only. Please note that non-vegetarian food may not always be available everywhere. Today's meal package includes breakfast only. Your trip ends here. You can proceed to your next destination from the Kullu-Manali Airport at Bhuntar. There is no pick-up for this Spiti motorbiking trip. You begin motorbiking from Delhi itself. Delhi is easily accessible by road, rail or air, from most domestic and international hubs. You can board a direct flight to Delhi's Indira Gandhi International Airport from most major cities in India.